These are THE BEST workout tights around. They are high-rise, comfortable, true to size and so comfortable. They stay put for workouts and look great for running around doing errands and playing with the kids. I promise you need these in your life. My mom introduced this podcast to me and I love listening to it for business development and encouragement in my work. Christy is a champion of women and so savvy in business. I love her encouragement, authenticity and passion. This face lotion has totally changed my skin in a major way over the last six months. It’s designed to adapt to your skin’s unique moisture needs and has made my skin glowing, vibrant and hydrated throughout the winter months. It’s a must-have in my book! I love this recipe that’s from the Espresso & Cream archives. It’s quick, easy, satisfying and filled with nutrients. Easy meals FTW. This isn’t a book but a really helpful website. They use data and science to reveal the true contents of consumer products, like baby formula, baby food, and more. It’s a really helpful site if you want to know what’s in the food that you’re buying – especially for baby formula! This post is sponsored by InComm s as part of the #SaveMoneyGiveBetter2017 campaign. All opinions are my own and I so appreciate you supporting the brands that make Espresso and Cream possible! Since it’s only November it may seem like I’m jumping the gun a little bit on Christmas, but for some reason this year I’ve felt especially festive. Maybe it’s the fact that my toddler is finally old enough to understand the concept of Christmas, or because it’s Collins’s first Christmas or a combination of both, but I’ve been humming Christmas carols since Halloween. I fully believe the point of Christmas is not material things or gifts, but for me gift giving is such a joyful process. To me, the holidays are the perfect time to make sure that those in our lives are recognized and appreciated for what they do and how much they mean through gifts and words of affirmation. It’s probably because I’m such a words of affirmation and quality time person, but it’s always less about the gift and more about the fact that someone took the time to write a sweet note and purchase the gift that means the most. 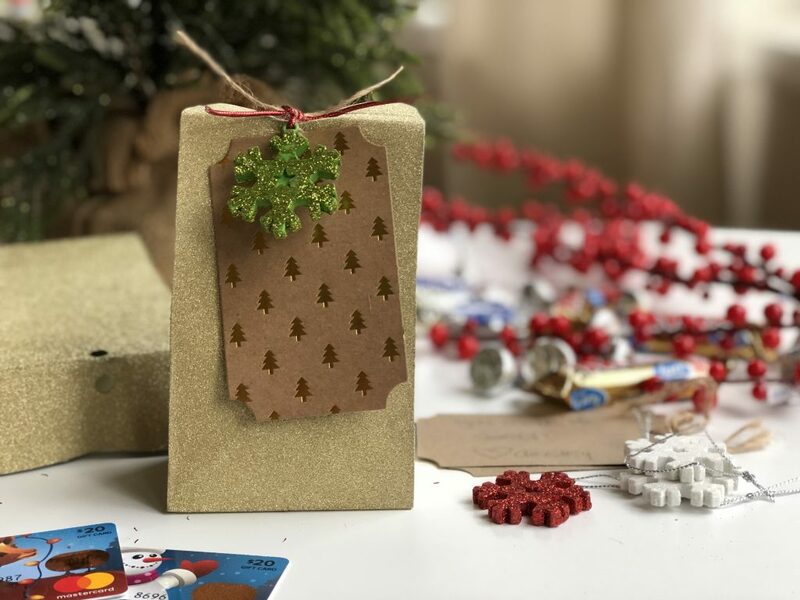 Also, as someone who is a habitual procrastinator, I’m bound and determined to make this year the year I get my cards out on time, my gifts wrapped in a leisurely fashion and don’t forget a single person on my list – from music teachers to childcare providers to friends and family. While grocery shopping at Walmart last week, Ainsley and I took a detour through the Christmas section. She got all excited about seeing “Olaf!” (aka a giant blow up snow man) and I got sucked into the giant gift card display. 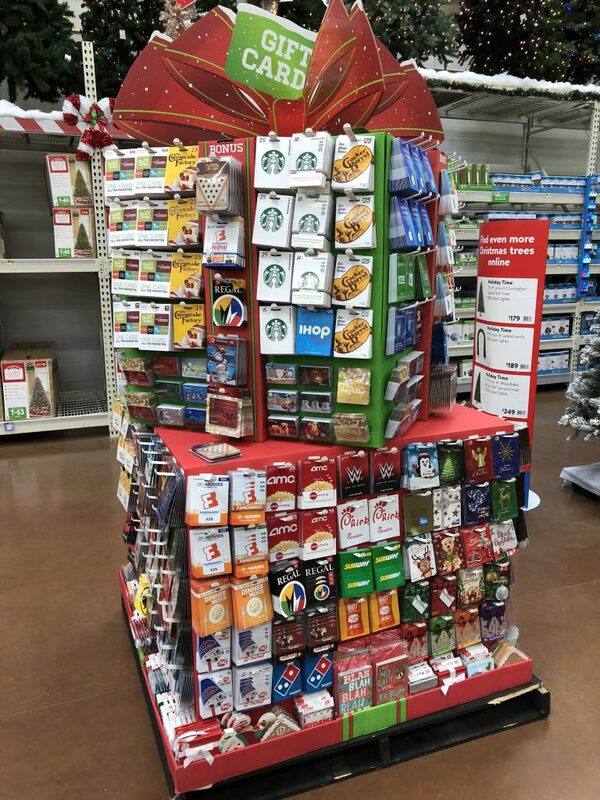 Since we live in a small town, our local shopping options are pretty limited and most of my Christmas shopping is done online, so I was excited to see how many different gift card options there were to choose from. Some may say gift cards are impersonal, but I LOVE receiving a gift card. It feels like forced shopping, in the best possible way. 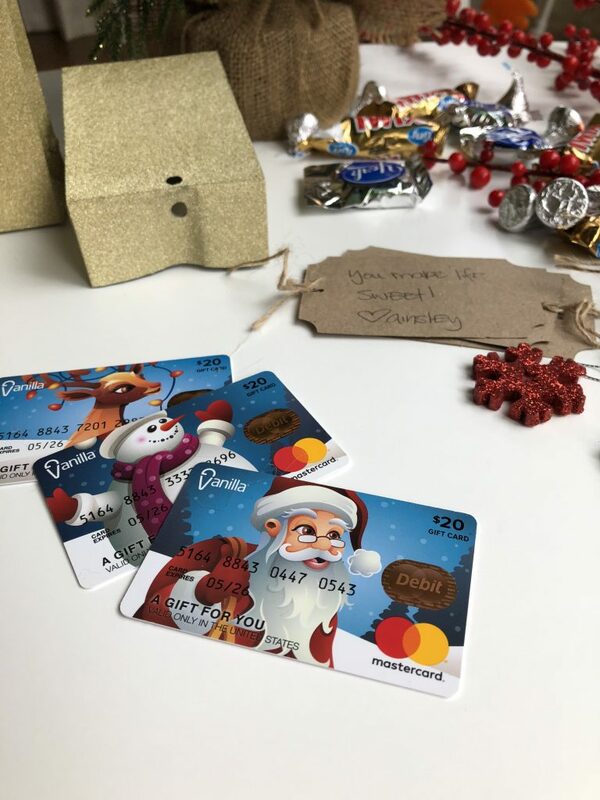 Ainsley is just getting to the age where she has a few more teachers, so we picked up a 3-pack of $20 Vanilla Mastercard Gift Cards to dress up and gift to people on our list. While there were a lot of options to choose from, I opted for a gift card that could be used for practically anything, since, like I said, we don’t live near a lot of stores and most of the people I know do plenty of online shopping. 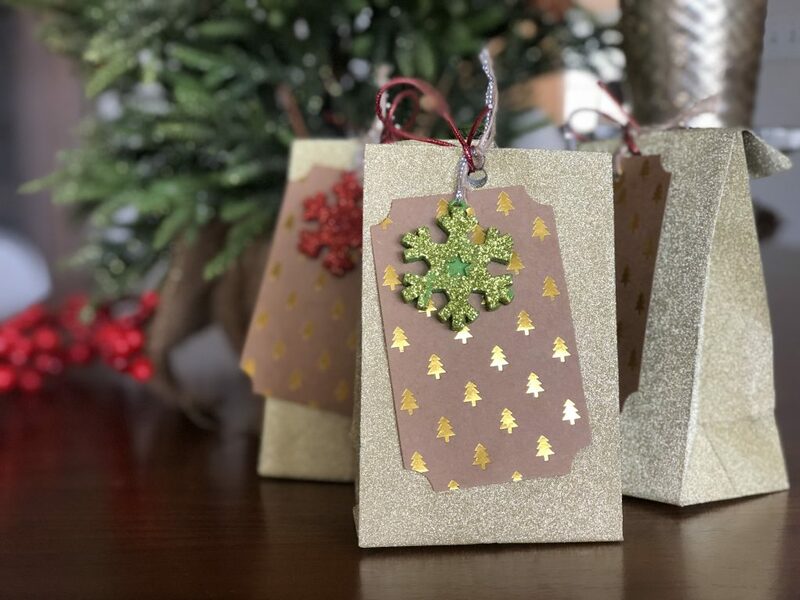 To make our gift-giving a little more special, we also snagged some of the cutest gold glitter gift bags, gift tags, mini snowflake ornaments and some candy to fill the bags with in addition to the gift card. Seriously, I’m not a crafty person by nature but I think these little handmade gifts turned out pretty cute. Hopefully Ainsley’s teachers feel the same! Hi friends! I hope you all had a wonderful weekend and are feeling ready to tackle whatever your week has in store. I wanted to hop on today and talk with you all about sponsored posts. 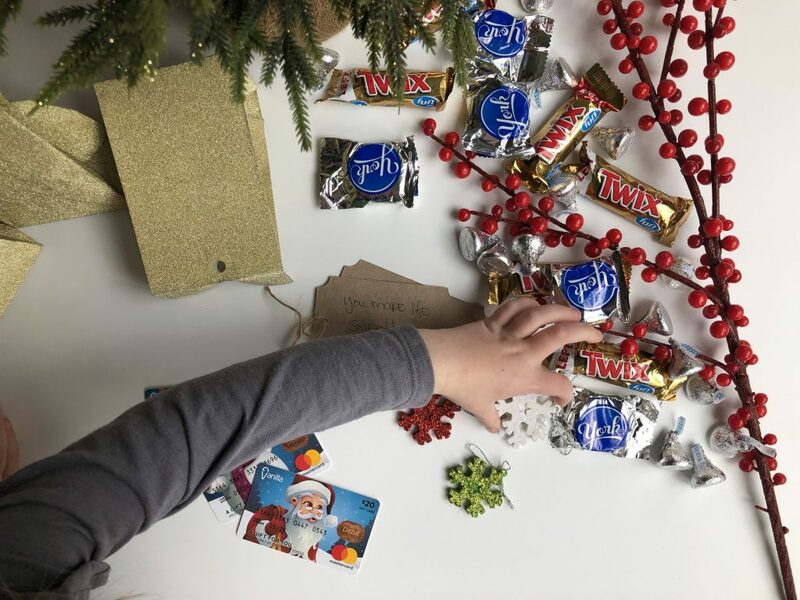 In the coming weeks/months, the way the editorial calendar and brand calendars aligned, you’ll be seeing a handful of sponsored posts and I wanted to take a minute to talk through my sponsored post selection process. First, sponsored content is what keeps the lights on over here. Blogging is part of my “wears many hats” career, and while it’s certainly not going to make me rich any time soon, I continue to blog because I LOVE writing, sharing, and being creative. That said, as my blog has grown it costs money to house the site on an adequate server, buy equipment for taking photos, props for recipes, etc. There are a lot of hidden costs that go into blogging and sponsored posts cover that for me throughout the year. I think there is an assumption that sponsored posts require the blogger to “sell out” and compromise themselves, watering down their opinions and voice in the process. And I understand that! Opportunities pop into my inbox frequently – I work with various influencer marketing agencies who send opportunities my way, brands sometimes reach out directly, and other times I reach out to the brand myself if I really love and use a product and think it would make sense to work together. Sometimes the opportunities that are presented to me are financially lucrative but I say yes to very few projects in the name of being authentic to the way my family lives, the products we actually use, and what I think you, my readers, would be interested in hearing about. Just recently a clothing company reached out and offered to pay me in $750 worth of high-end clothing in exchange for a shout-out. But when I looked at their website most of the blouses were more than $250, a price I knew most of you wouldn’t or couldn’t afford, so I declined the offer. Sometimes it’s hard to say no to opportunities like that, because who doesn’t want expensive clothes for free? But ultimately accepting sponsored posts that aren’t a good fit for Espresso and Cream would undercut my credibility with YOU. And you all are the most important part of this whole thing. I tend to gravitate toward sponsored posts that incorporate places I regularly grocery shop (Walmart, in our area) or that allow me to use my expertise and experience as a recipe developer by giving you a new recipe to try. I try to always ask myself, “Would I buy this product in my daily life outside of this sponsored post?” or “Would I normally shop at this retailer?” If the answer is “no” then I pass every. single. time. So, with that said, I just wanted to lay the groundwork for the upcoming sponsored posts that you’ll be seeing on Espresso and Cream! I’ll be the first to tell you I’m an avid reader who has fallen off the wagon in recent years. I used to devour books as a child and young adult, but motherhood pushed reading anything long-form to the back burner unless it was a book about sleep training, potty training, or something so very practical that I needed to know to move forward in my parenting journey. A couple months ago I started reading The Miracle Morning by Hal Elrod (more on that later…) and one of the things I loved the most about the book was the emphasis on making reading part of your daily (early) morning routine. I don’t think it’s a coincidence that after reading The Miracle Morning I also happened to complete a handful of other books, and for someone who has been stuck in a start-stop pattern with book reading that’s really saying something! My biggest tip if you want to get back into the habit of reading books would be to make small goals, like reading just 5 or 10 minutes per day, and easing into reading again. I got stuck telling myself that I didn’t have time to read, because I had the misconception that I needed to have an hour to read if I was going to really get into a book. But the truth is that I don’t know if I’m going to consistently have an hour to read for the next 10 years while raising little kids, so I’m biting off small chunks. Also, although I much prefer hard copies of books, in this season of life, having books on Kindle and the Kindle app on my phone is more practical. Then, instead of reaching for my phone to scroll social media when I have down time, I’m more likely to open my Kindle app and read a few pages instead. Here’s what I’ve been reading lately! Like I mentioned above, The Miracle Morning was the book that jumpstarted all my new reading. I’m already a morning person by nature, but this book was an awesome read that encouraged some really wonderful, new practices into my morning routine and gave it additional structure and purpose. If you’re a mom, chances are you’ve read at least one of the beautiful essays on the blog Coffee + Crumbs. I’m always encouraged by their site and podcast and this book is no different. It’s a collection of essays about motherhood that had me feeling all the feels. I cried so many happy/sad tears while reading this book that Joe was worried about me. I would highly recommend this as a gift to the new moms or expecting moms in your life! 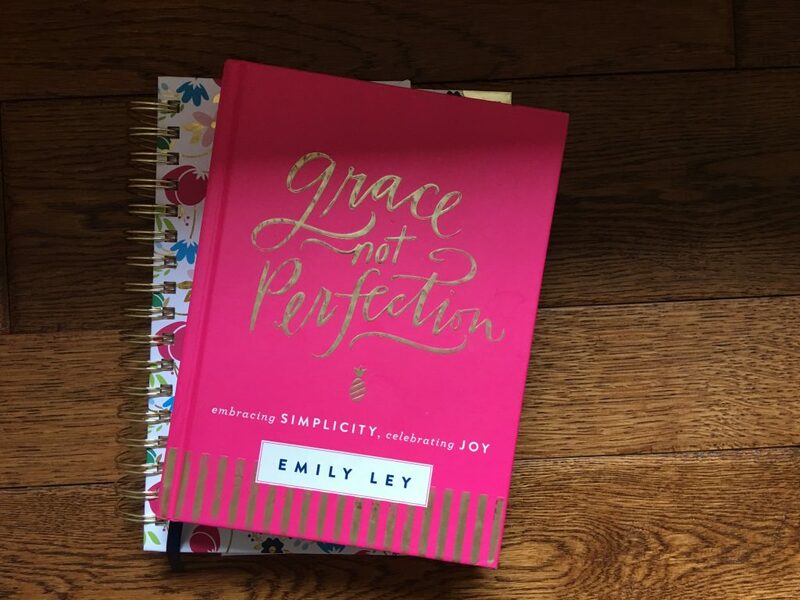 The Simplified Planner creator, Emily Ley, is a mom of three little kids, including a set of twins who are Ainsley’s age. 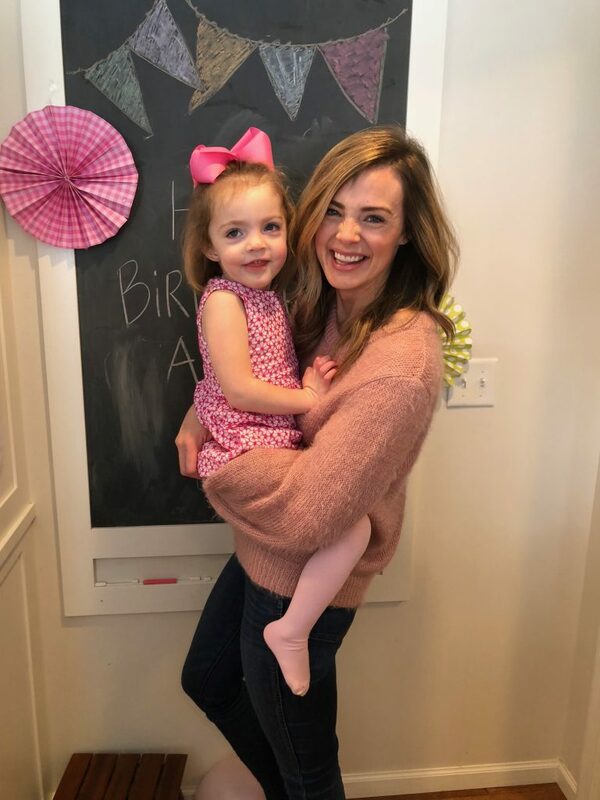 I loved her book – which is not only beautiful but also a really encouraging, heartfelt read about finding time for what truly matters and giving yourself grace in the journey of motherhood. She had me laughing, nodding in agreement and even crying at times. Yes, this is a parenting book, a potty training book none the less, but it was such a helpful, funny read! Anyone who can make potty training both educational and entertaining gets all the kudos in my book. And if you’re even thinking about potty training your toddler, get this book sooner rather than later. 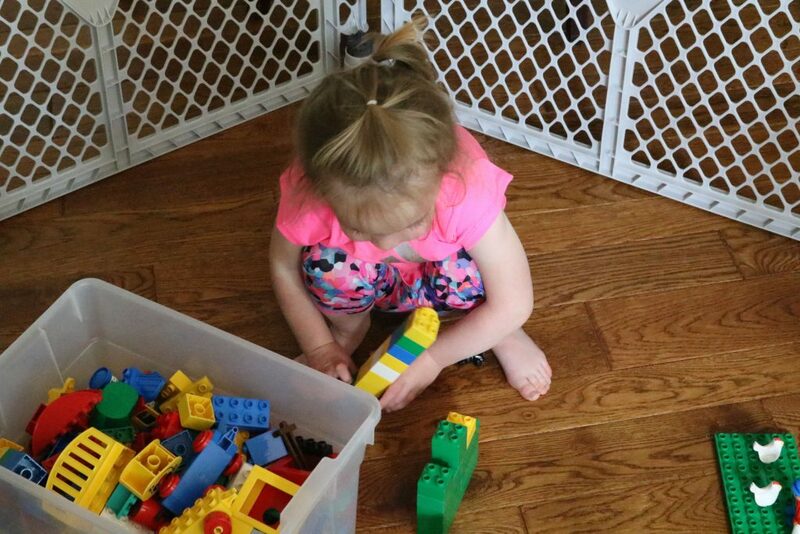 Our potty training experience was so smooth and uneventful because of it. Friends! You need to read this book. If you’ve ever wanted to live a healthier lifestyle and improve your wellness but also want to find a happy balance of still living life, I can’t recommend this book enough. The author, Phoebe, is a personal chef and blogger who spent a year in search of improving her health and overall wellness. I learned so much about gut health, stress management, and more. And I think anyone who is curious about how their personal care products impact their health will find that chapter particularly eye-opening. I hated this book. And I don’t say that lightly. I know, it’s trendy and gets rave reviews all over the internet but I just couldn’t stomach this book. Although the author talked a lot about God and faith, her entire perspective on the topic was very mystical and hardly rooted in sound Biblical principles. It was very “rah rah!” “the power is within you!” and while that might feel good to read, and I’m all about empowerment, I think self-reliance is a slippery slope. Additionally, I felt the book was repetitive and light on actual content. Being a work at home mom (WAHM) has been one of the biggest blessings and challenges of my career. When I worked a corporate 40-hour per week job I dreamed about having a flexible work schedule, setting my own hours and working when it worked for me, spending plenty of time with my kids along the way. And while being your own boss IS amazing in a thousand different ways, being a WAHM is also seriously challenging at times. Now that I’m a year and a half into this work at home thing, I’m just starting to feel like we’re finding a rhythm – a way for me to get the work done that I need to while spending as much time as I can with my girls. I told Joe that last year would be my “year of learning” as I figured out how much childcare I needed, how to juggle my clients and what projects to say “yes” to. Hint: Saying “no” is hard as a freelancer but often necessary. 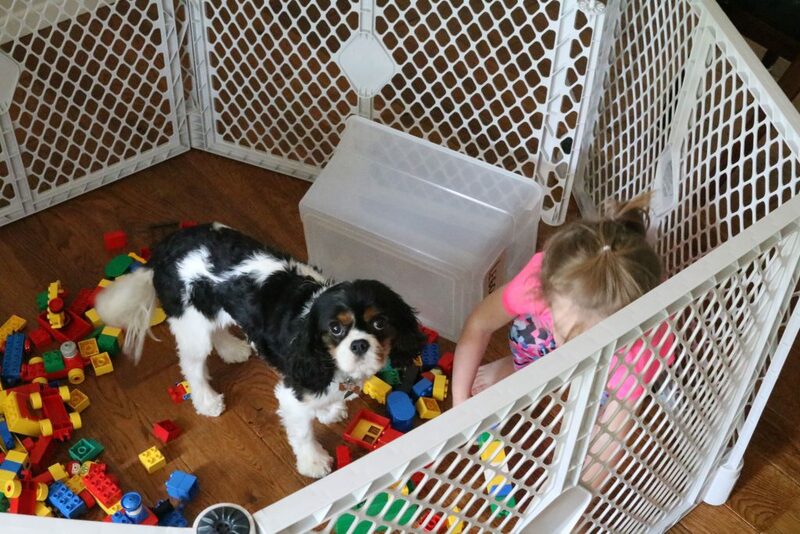 One of the unexpected benefits of working from home has been the fact that Ainsley (and hopefully Collins down the road) has learned the art of independent play. I try to not work around Ainsley more than I need to, but sometimes I do sneak in a little work during the days when I don’t have childcare lined up or a babysitter cancels or a deadline looms. 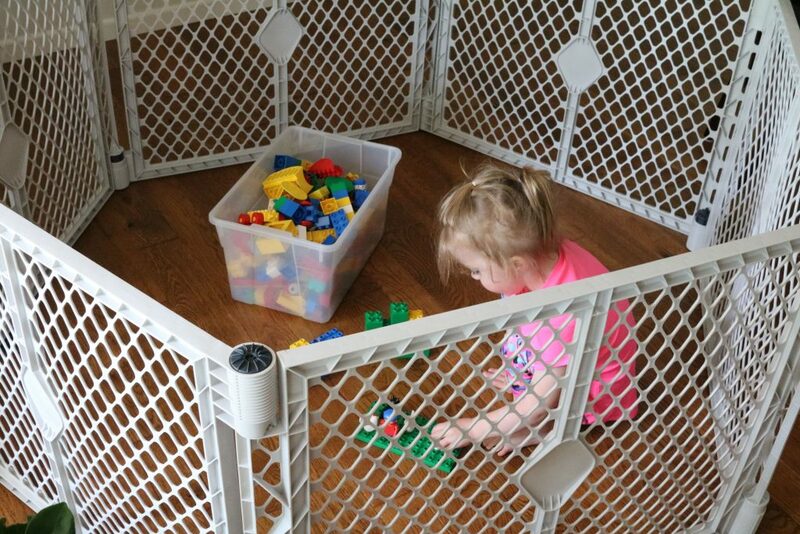 It’s amazed me how much use we’ve gotten out of the play yard already, allowing me to get a little work done around the house, too. 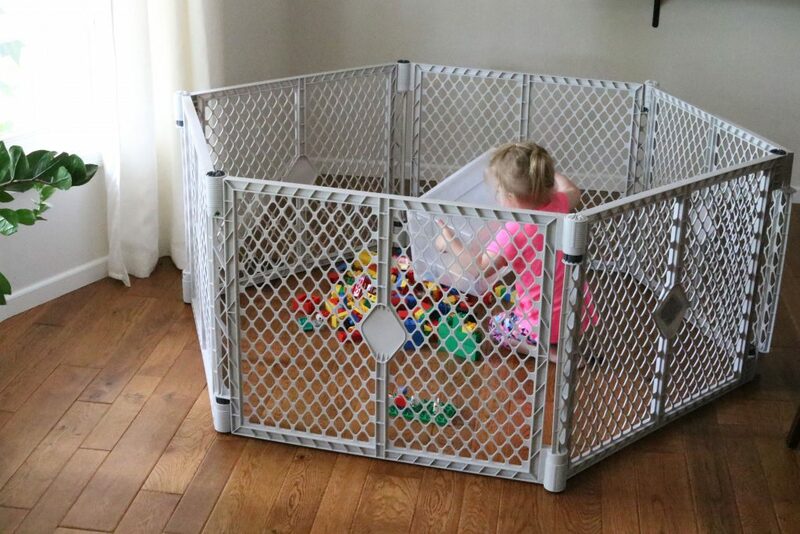 And as Collins gets older, I’m looking forward to using it to keep a mobile baby contained in a safe play space in the house. Want to see the Superyard Classic in action? Check it out in our home below. The best news? North States graciously agreed to give away one Superyard Classic Play Yard to an Espresso and Cream reader. Enter to win below!